You can use Google Hangouts to help boost exposure for your social marketing campaign. Before you host a Hangout, determine whom you would like to invite. You might be inclined to invite the public, but that sometimes can come with a unique set of problems. Public Hangouts sometimes bring in people who like to disrupt Hangouts or act silly, ruining the discussion for many. It might be better to invite your extended circles, or friends of friends, in order to keep the discussion a pleasant experience for everyone. 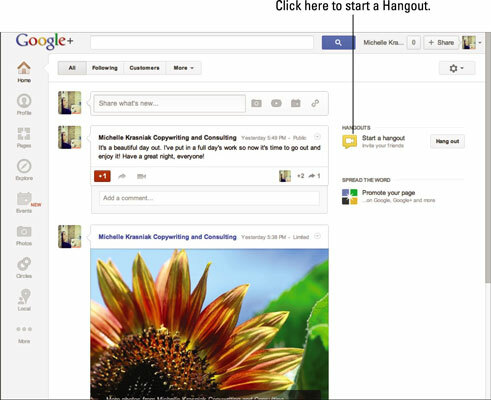 Click the Start a Hangout button in the right pane of your Google+ stream. If this is your first Hangout, you may be prompted to install the Google Voice and Video plug-in. If that happens, click the Install Plugin button, let the download magic happen, and then do Step 1 again. The Start a Hangout screen appears. Click the Invite People button to select whom to invite. 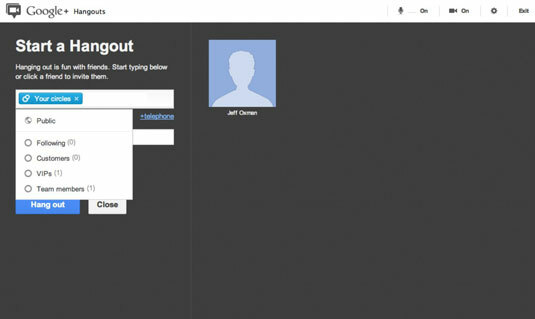 The next screen lets you invite people by entering their name, telephone number or e-mail address into the box at the top. To invite entire Circles, click inside the box and select the Circle you want to invite from the drop-down list. Before opening a Hangout to the people in your Circles, do a few trial runs by yourself or with a trusted friend or team member. Make sure you know how to handle the basics before going live. Name your Hangout by clicking inside the Name This Hangout box. By default, the Enable Hangouts on Air check box is deselected. If you want to record and broadcast your Hangout, you need to host a Hangout on Air. Decide whether you want to restrict minors from watching and participating in your Hangout. If you do not want them to, select the Restrict Minors from Joining check box. If your company produces products that are for the 18+ or 21+ year-old crowds, it’s a good idea to check this box to make sure that the material remains for adult eyes only. Anyone who is younger will not be allowed to attend. You can find the Restrict Minors check box by clicking the Hangout Options box located directly under the Enable Hangouts on Air check box. When you’re finished selecting these options, click the blue Hang Out button. You then see a screen that displays “Waiting for people to enter this Hangout” until other people join you. You can also invite more people to your Hangout by clicking the Invite More button in the center of the screen. As soon as others show up, you can start talking. Whoever is currently talking will have a larger image on display, one that’s front and center. The rest of the participants are arranged at the bottom of the screen with a smaller display image showing. The Hangouts on Air feature allows you to broadcast your Hangout live on your Google+ page, YouTube channel, and company website. You can also record it, and it will automatically be uploaded to your YouTube channel and Google+ page when the Hangout is complete. To host a Hangout on Air, follow the instructions for hosting a Hangout, and in Step 3, select the Enable Hangouts on Air check box. 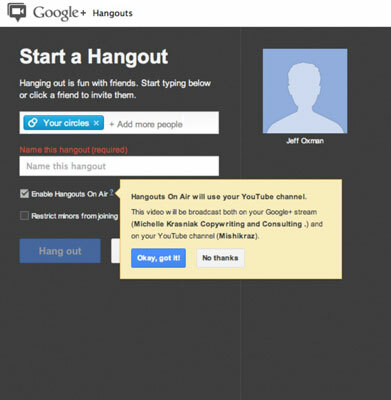 You’ll see a notice that your Hangouts on Air will broadcast on both YouTube and Google+. To agree to this, select OK. If you’re not happy with this, you may exit and cancel your Hangout plans. Now, you’re not quite ready to get started yet because you have to agree to the terms. Yes, there are terms. You have to agree to allow Google to show your Hangout via YouTube and other Google owned apps, sites, and widgets. If this is still agreeable, check the box to indicate that you accept the terms. If you invited special guests — for example, if you’re interviewing someone — give them any necessary instructions for participating in the Hangout. Some people choose to do this via e-mail, and others give instructions on Skype, via phone or even a private Google+ message. You may want to let the other party know the type of questions you’re asking or whether you’re going to be allowing a Q&A from others. Make sure they know anyone who is in the Hangout can talk. When you’re ready to set up the Hangout on Air, select the Start Broadcast button. You’ll see a count down and after the number 1, you’ll hear a chime, and you’re live.